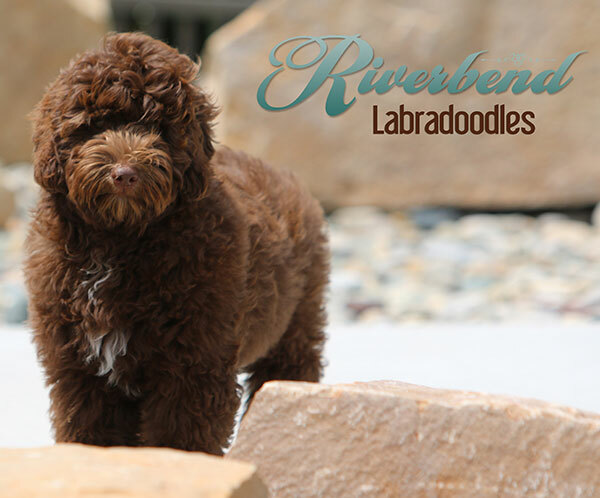 THANK YOU FOR YOUR INTEREST IN OUR RIVERBEND AUSTRALIAN LABRADOODLE BREEDING STOCK! 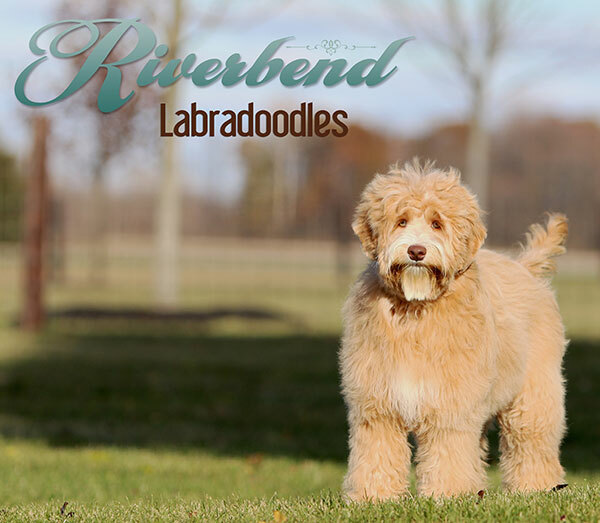 If you are an established breeder or looking for a mentor, are interested in adding Riverbend genetics to your own Labradoodle lines, please contact us directly. Our young adults are health tested, and started with professional trainers. We carefully research and select only the finest dogs for our breeding program, in order to produce a Labradoodle true to type, with predictable size, temperament, and coat. 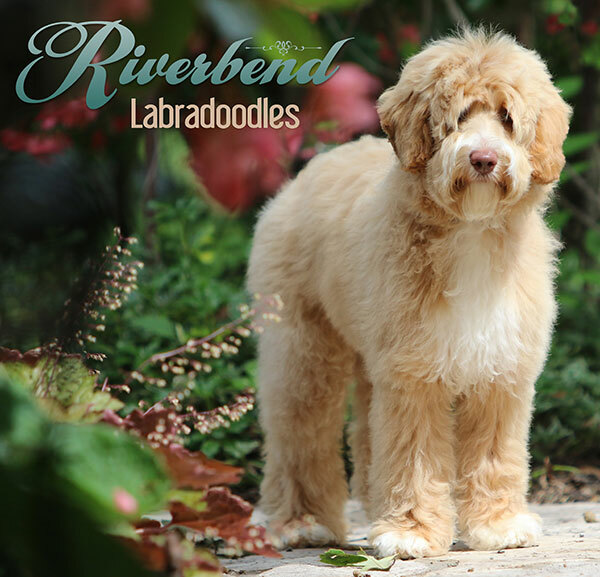 Our years of dedication to breeding only the finest American and Australian lines is evident in the style and grace of a Riverbend Labradoodle. 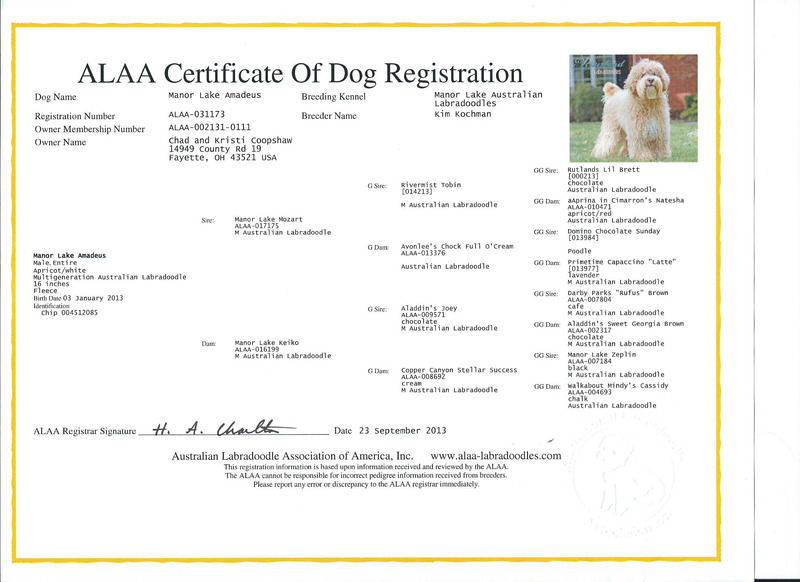 They have stamped a consistant type and look that is unmatched in the Labradoodle community. 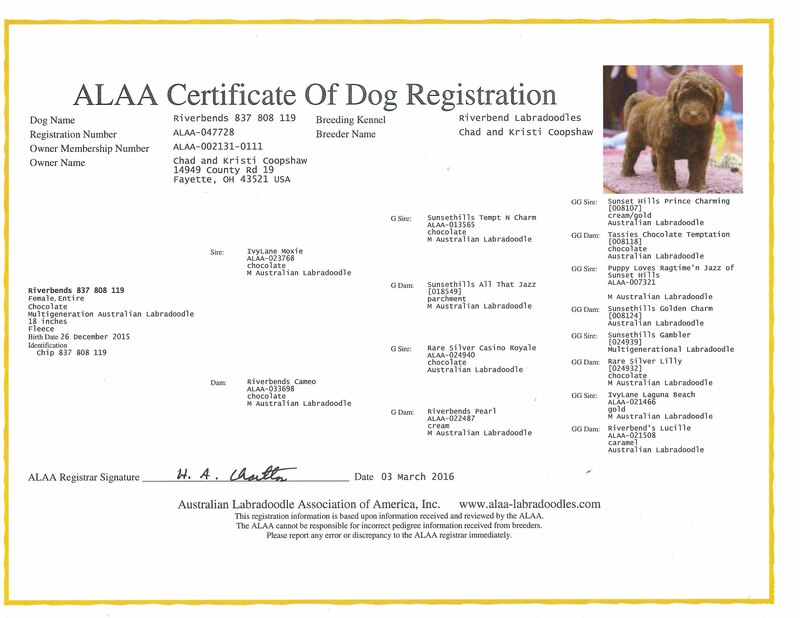 Below you may find current pictures of previous breeding dogs that have been provided to other breeding programs. You will also find a listing of all health testing that has been completed, and general information about these dogs. Feel free to call or email with any additional questions or information. 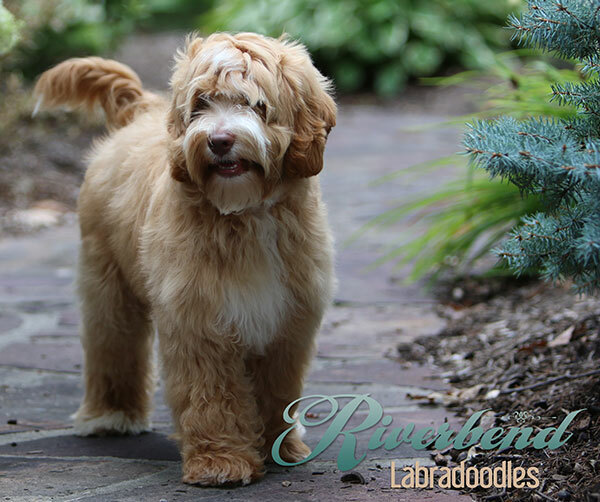 Thank you for your interest in Riverbend Labradoodles, LLC. Dolly has joined Brookside Labradoodles with Tim and Bonnie Anoskey in California! 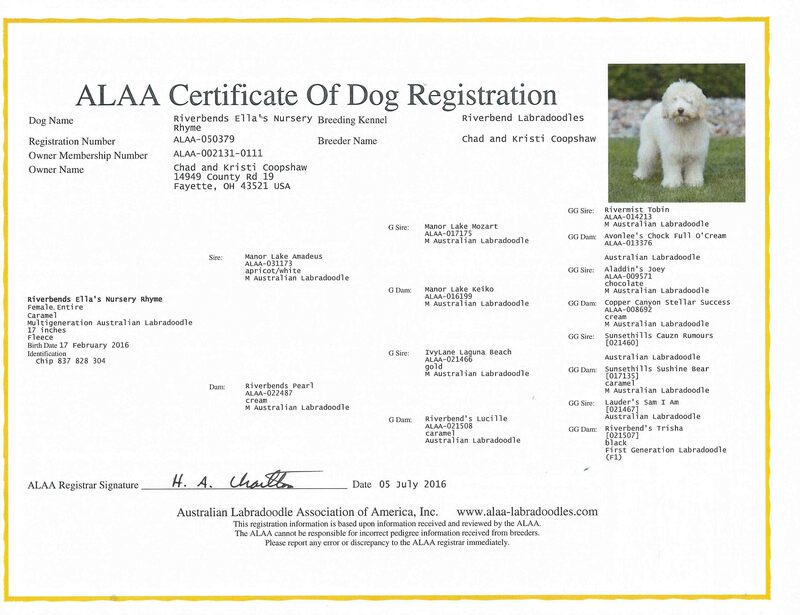 “Dolly” Multi-gen Australian Labradoodle, DOB 6/18/17, Sire: Manor Lake Amadeus Dam: Spring Creek’s Chantilly Lace, ALAA registered caramel and white female. 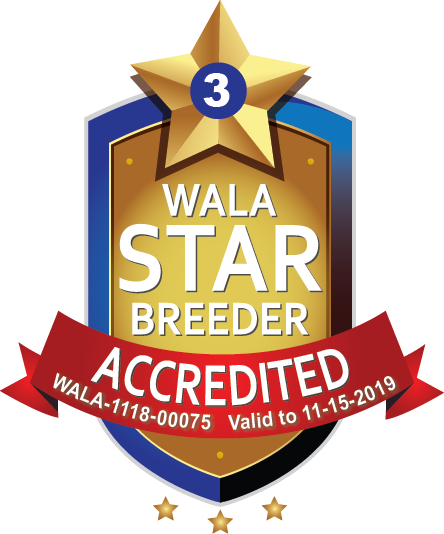 Size expected: Small Medium, 17 inches, approximately 25lbs OFA Hips Good, OFA Elbows Clear, ACVO Eyes Clear, Sire is entire PPG Panel Clear by Parentage, and Dam is tested Clear for DM, EIC, and PRA. Dolly is an IC Carrier. She is also a parti and phantom carrier (at/at, KB/ky, S/sp). Her DNA Profile has also been completed. Dolly has been raised in our home, is crate-trained, house-broken, and fully vaccinated. She loves to be the center of attention and the life of the party! She is playful and carefree and loves everyone! Dolly spent 4 weeks with a professional trainer building a foundation of great behavior, and expanding her experiences and socialization. Everyone that meets her, loves her, and raves about what a sweet girl she is. 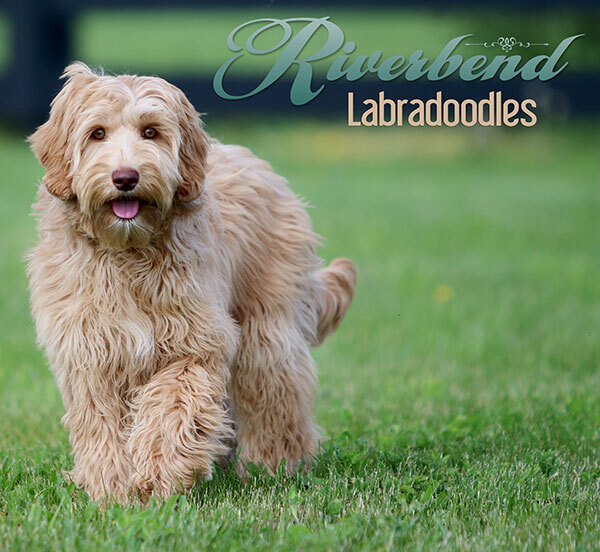 We are excited to see the contributions she will make in the Australian Labradoodle world as she joins another breeder’s program and family! Elliott has joined Neilly Labradoodles with Les and Marie Stuckel in Alberta, Canada! 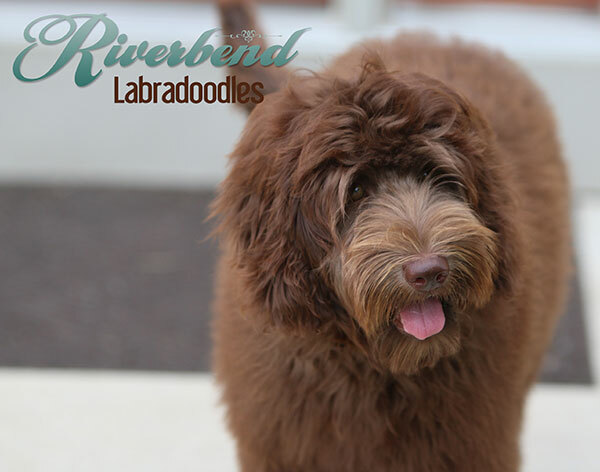 “Elliott” Multi-gen Australian Labradoodle, DOB 2/09/17, Sire: IvyLane’s Moxie Dam: Riverbend’s Autumn Breeze, ALAA registered chocolate boy. Size expected: Medium, 18 inches, approximately 30lbs. OFA Hips Good/Elbows Clear, Dr. Wallace Hips Good, ACVO Eyes Clear, PRA/prcd, EIC, DM, VWD, and IC are Clear by Parentage. Elliott is sweet and loving, and is a typical noodle-doodle lap dog. He is friendly and easy-going, and loves everyone he meets! Elliott will be Medium in size and have a gorgeous fleece coat. He has just come home from spending 4 weeks with a professional trainer for fantastic foundational training and socialization! He has been raised in our home, is crate-trained, house-broken, and fully vaccinated. Elliott is currently available, as his health testing is completed, and he will make a fabulous addition to someone’s family and breeding program! 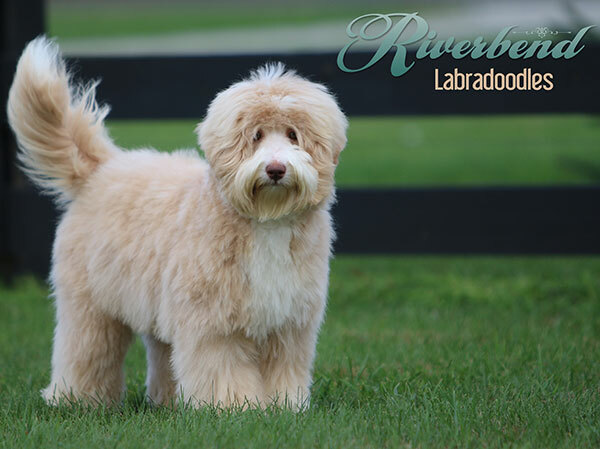 Nikki has joined Deer Creek Labradoodles with the Sandi O’Banion Family in Kentucky! 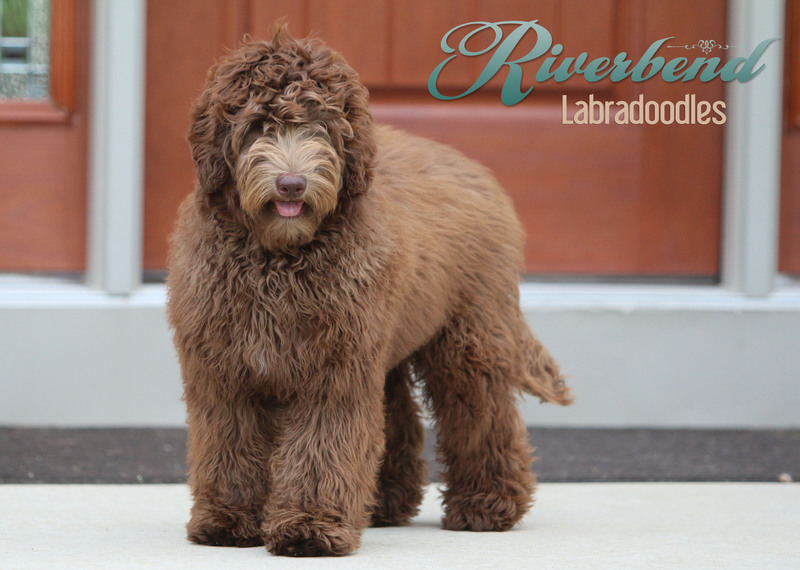 Riverbend’s Careless Whisper: DOB 11/13/16, Sire: Manor Lake Amadeus Dam: Riverbend’s RU a Keeper, ALAA registered chocolate female. Size expected: 16 inches, 25bs and she has a gorgeous fleece coat. OFA Hips Good, OFA Elbows Clear, Dr. Wallace Hips Good, Dr. Wallace Elbows Clear, ACVO Eyes Clear, PPG Panel Clear by Parentage, PRA/prcd tested Clear. IC is also Clear by Parentage. Nikki is laid-back and easy-going and has a stunning, magnificent look, with her exceptionally solid boning, and beyond perfect conformation! She has a gorgeous chocolate fleece coat, beautiful hazel-brown eyes, and her structure is perfection. This adorable girl is full of sweetness and has the most charming personality. She has just returned from 4 weeks with a professional trainer for fantastic foundational training and socialization! She has been raised in our home, is crate-trained, house-broken, and fully vaccinated. She is currently available and we feel she will make a fabulous addition to someone’s family and breeding program! 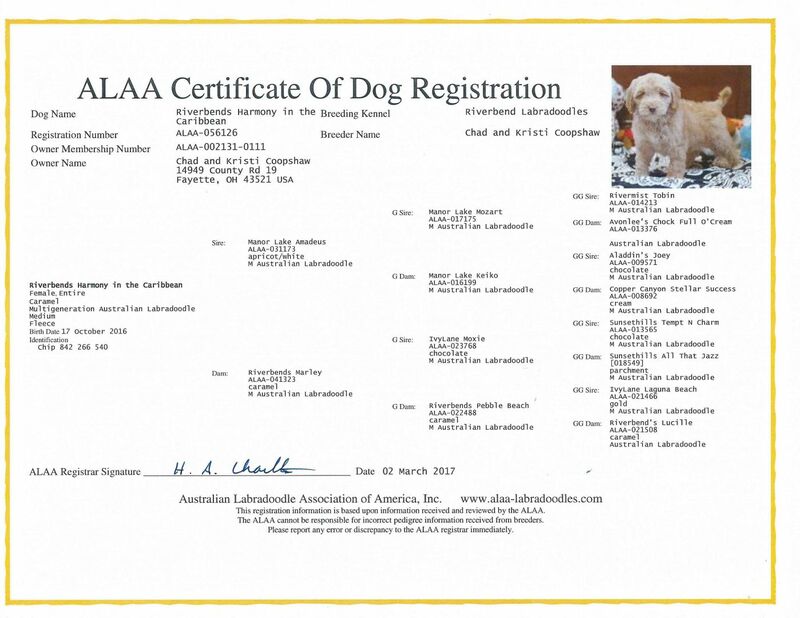 Harmony has joined Magnolia Australian Labradoodles with Judy Adams in Ohio! Riverbend’s Harmony In The Caribbean: DOB 10/17/16, Sire: Manor Lake Amadeus Dam: Riverbend’s Marley, ALAA registered caramel female. Size expected: Small Medium, 17 inches, 25lbs and she has a gorgeous fleece coat. OFA Good, OFA Elbows Clear, Dr. Wallace Hips Good, Dr. Wallace Elbows Clear, ACVO Eyes Clear, PPG Panel Clear by Parentage, IC is also Clear by Parentage. Harmony is a sweet, loving girl with a laid-back and easy-going temperament. She has a stunning look, with solid boning, and fantastic conformation! She has a gorgeous wavy fleece caramel coat, with the cutest white mis-marks, and beautiful hazel-brown eyes. She has returned from 4 weeks with a professional trainer for fantastic foundational training and socialization! She has been raised in our home, is crate-trained, house-broken, and fully vaccinated. 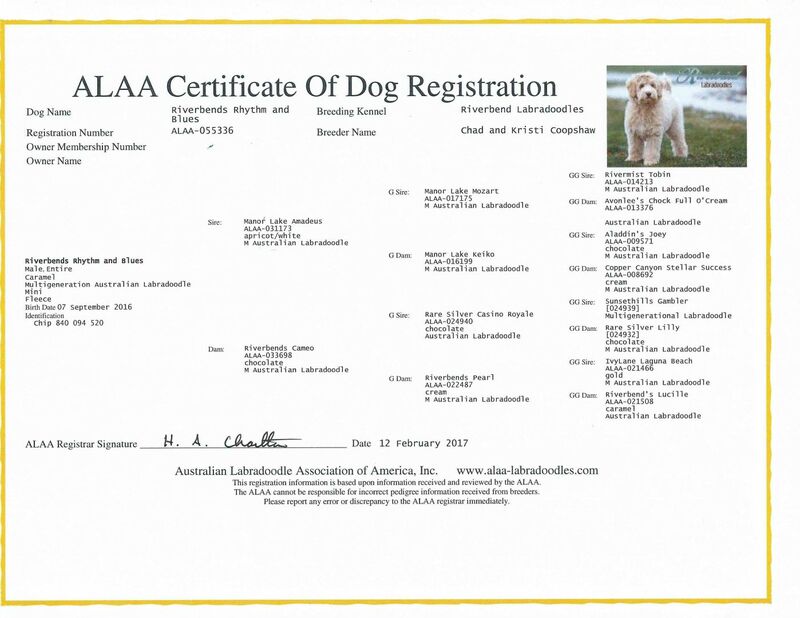 We are excited to see the contributions she will make in the Australian Labradoodle world, whether she joins another breeder’s program, or stays here with us in our program! Kaya has joined Ashford Manor Labradoodles with Cheryl Sabens in Indiana and Becky Coulter with St. Louis Australian Labradoodles in Missouri! Riverbend’s Smile Jamaica-Kaya: DOB 10/17/16, Sire: Manor Lake Amadeus Dam: Riverbend’s Marley, ALAA registered caramel female. Size expected: Small Medium, 17 inches, 25lbs and she has a gorgeous fleece coat. OFA Hips Excellent , OFA Elbows Clear, Dr. Wallace Hips Good, Dr. Wallace Elbows Clear, ACVO Eyes Clear, PPG Panel Clear by Parentage, IC is also Clear by Parentage. Kaya is a sweet, loving girl with a laid-back and easy-going temperament. She is a lap-dog, cuddle bug of love! Kaya is a beautiful girl and has a gorgeous wavy fleece caramel coat, with the cutest white mis-marks, and beautiful hazel-brown eyes. She has just returned from 4 weeks with a professional trainer for fantastic foundational training and socialization! She has been raised in our home, is crate-trained, house-broken, and fully vaccinated. 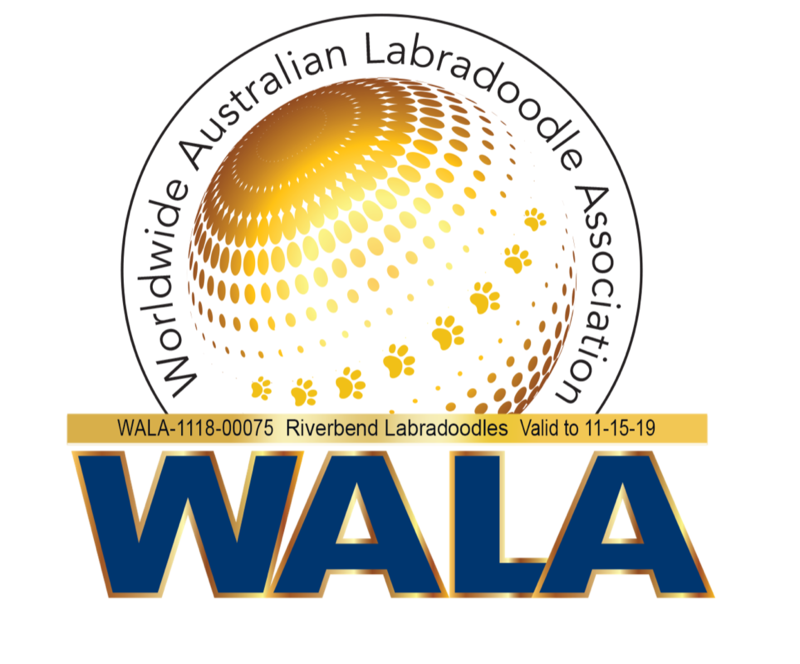 We are excited to see the contributions she will make in the Australian Labradoodle world, whether she joins another breeder’s program, or stays here with us in our program! 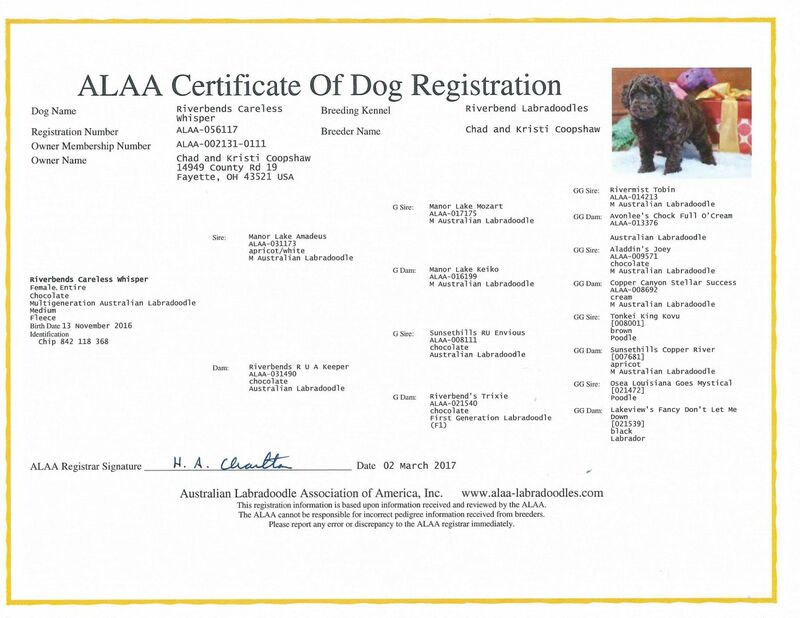 Annie has joined Heritage Manor Labradoodles with Emile and Carla Zinser in Ohio! 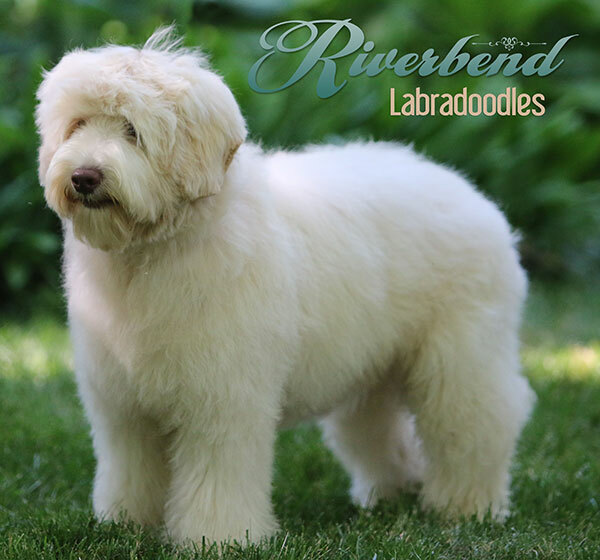 Riverbend’s Polar Express: DOB 10/12/16, Sire: Manor Lake Amadeus Dam: Riverbend’s Pearl, ALAA registered caramel and white girl. Size expected: Mini, 16 inches, 20-25lbs. Hips are Good per Dr. Wallace, and OFA Hips Good and Elbows Clear. PRA/prcd, EIC, DM, VWD, and IC are Clear by Parentage. Annie has been raised in our home, is crate-trained, house-broken, and fully vaccinated. She loves to be the center of attention and the life of the party! She is a typical noodle-doodle lap dog, and loves to have her tummy rubbed! She is playful and carefree and loves everyone! Annie spent 3 weeks with a professional trainer building a foundation of great behavior, and expanding her experiences and socialization. Everyone that meets her, loves her, and raves about what a sweet girl she is. 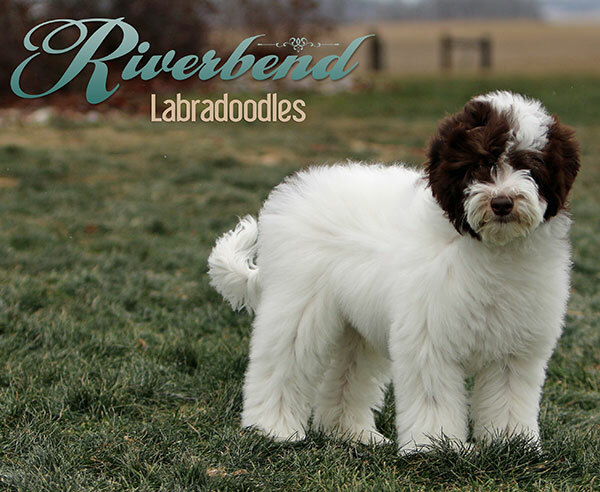 We are excited to see the contributions she will make in the Australian Labradoodle world as she joins another breeder’s program and family. 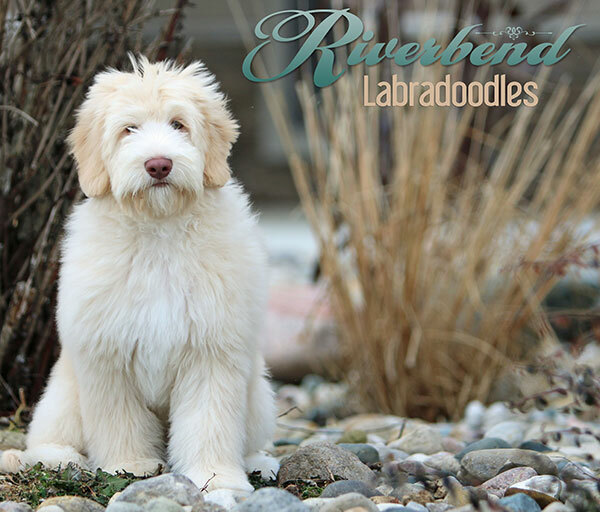 Colder has joined Heritage Manor Labradoodles with Emile and Carla Zinser in Ohio! 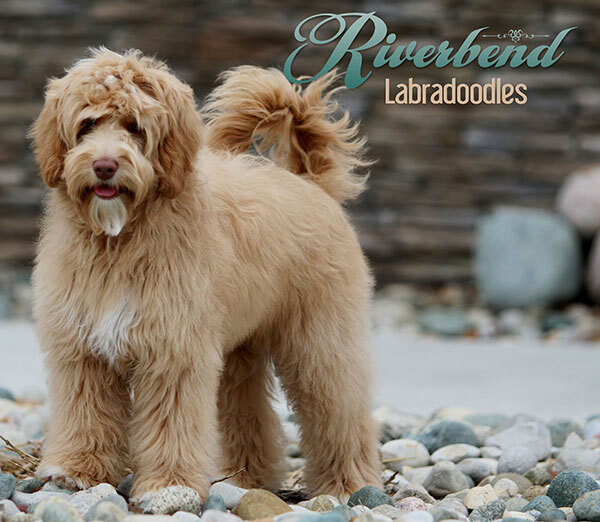 Riverbend’s Polar Express: DOB 9/12/16, Sire: IvyLane’s Moxie Dam: Riverbend’s Skippin’ To The Melody, ALAA registered caramel boy. Size expected: Medium, 18 inches, 35lbs. Hips are Good per Dr. Wallace, and OFA Hips and Elbows are pending. PRA/prcd, EIC, DM, VWD, and IC are Clear by Parentage. Colder is the absolute sweetest boy! He is laid-back and easy-going and chilled out and cool as a cucumber! LOL! He loves everyone and cuddling is his favorite activity! He will be Medium in size and have a gorgeous fleece coat. He has just returned from 3 weeks with a professional trainer for fantastic foundational training and socialization! He has been raised in our home, is crate-trained, house-broken, and fully vaccinated. He will be available as soon as his health testing is completed and will make a fabulous addition to someone’s family and breeding program! 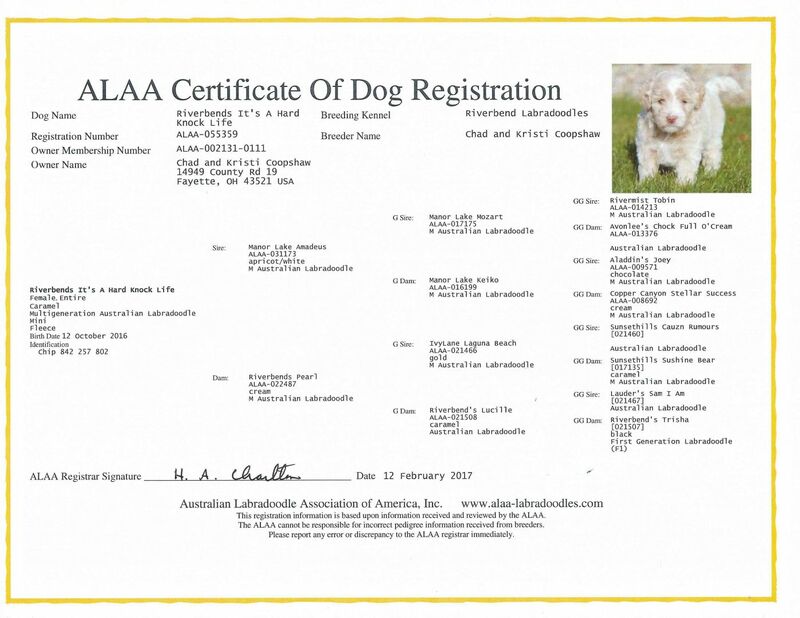 Elvis has joined Jollity Labradoodles with Corinne Groth in Switzerland and Gina de Jonge at Kuestendoodles in Germany. Riverbend’s Hunk Of Burnin’ Love: DOB 9/07/16, Sire: Manor Lake Amadeus Dam: Riverbend’s Cameo, ALAA registered chocolate/white parti boy. Size expected: Small Medium, 16-17 inches, 25-30lbs. PRA/prcd, EIC, DM, VWD, and IC are Clear by Parentage. Elvis is not only drop dead gorgeous, but his temperament is perfection! He is happy go lucky, social, loving and adorable! He has the noodle-doodle down pat and loves his tummy rubs! He is currently spending 3 weeks with a professional trainer for fantastic foundational training and socialization! He has been raised in our home, is crate-trained, house-broken, and fully vaccinated. He will be available as soon as his health testing is completed and will make a fabulous addition to someone’s family and breeding program! 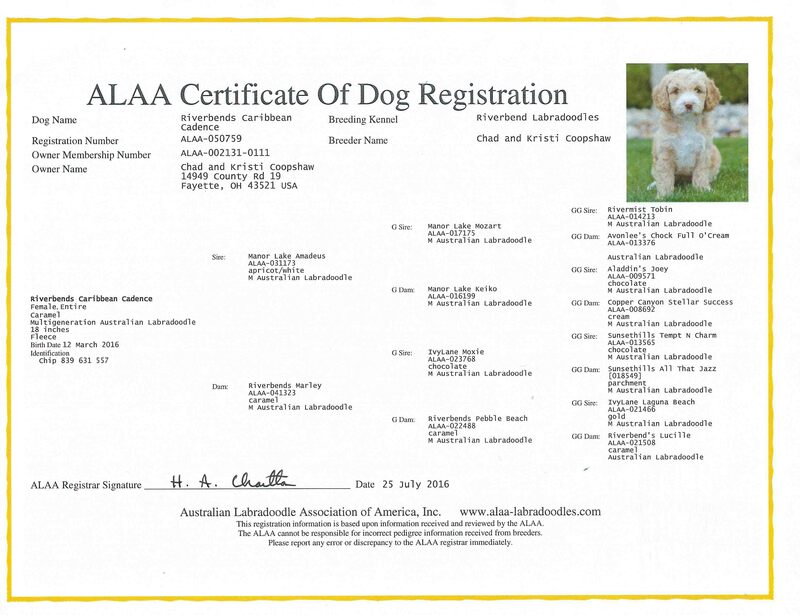 Presley has joined Brasken Labradoodles with Brandon and Kristen Silva in California! Riverbend’s Rhythm And Blues: DOB 9/07/16, Sire: Manor Lake Amadeus Dam: Riverbend’s Cameo, ALAA registered caramel boy. Size expected: Small Medium, 16-17 inches, 25-30lbs. PRA/prcd, EIC, DM, VWD, and IC are Clear by Parentage. Presley loves to be the center of attention and the life of the party! He is a typical noodle-doodle lap dog and is cool and easy-going, and loves everyone he meets! He will be small Medium in size and have a gorgeous fleece coat. He is currently spending 3 weeks with a professional trainer for fantastic foundational training and socialization! He has been raised in our home, is crate-trained, house-broken, and fully vaccinated. He will be available as soon as his health testing is completed and will make a fabulous addition to someone’s family and breeding program! 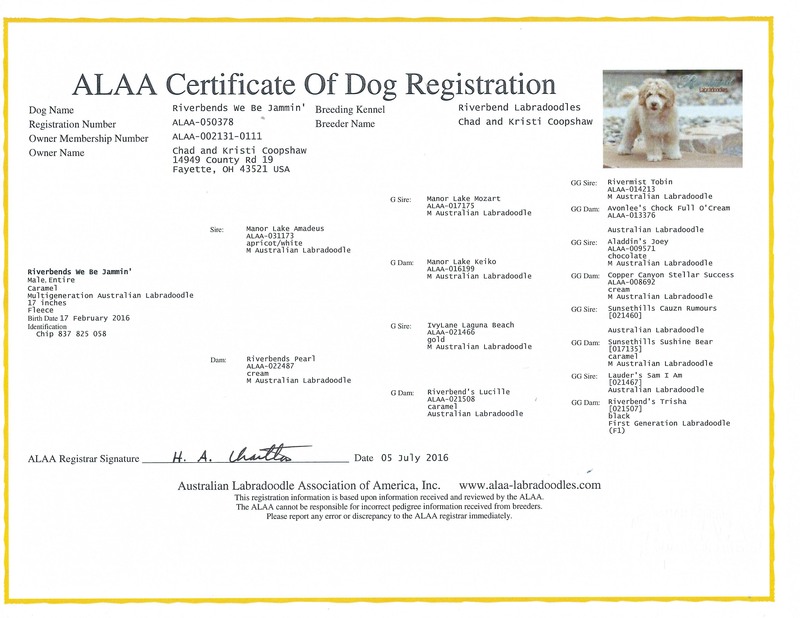 Winnie has joined Manor Lake Australian Labradoodles with Kim Kochman in Washington State! Riverbend’s Promise From My Heart: DOB 6/03/16, Sire: Manor Lake Amadeus Dam: Riverbend’s Cross My Heart, ALAA registered cream girl. Size expected: Mini, 15-16 inches, 20lbs. Hips Good via Dr. Wallace, ACVO Eyes Clear, PRA/prcd, EIC, DM, VWD, and IC are Clear by Parentage. Winnie loves to be the center of attention and the life of the party! She is a typical noodle-doodle lap dog, and loves to have her tummy rubbed! She is cool and easy-going, and playful and carefree depending on the activities she is involved in. She will be Mini in size and have a gorgeous fleece coat. She has just come home from 3 weeks with a professional trainer for fantastic foundational training and socialization! She has been raised in our home, is crate-trained, house-broken, and fully vaccinated. She is currently available and will make a fabulous addition to someone’s family and breeding program! 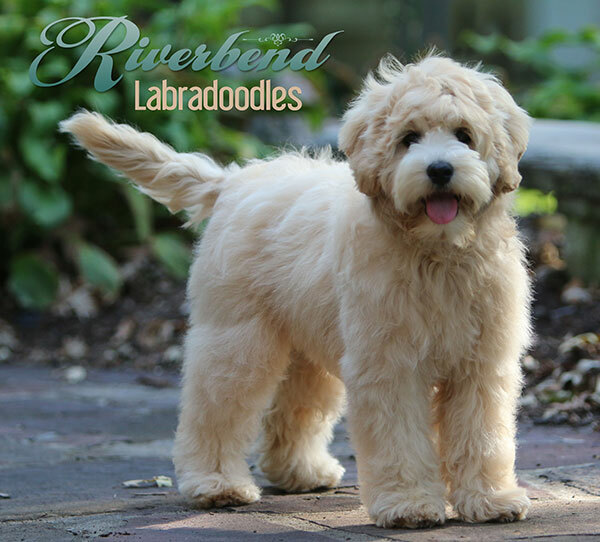 Riverbend’s We Be Jammin’: DOB 2/17/16, Sire: Manor Lake Amadeus Dam: Riverbend’s Pearl, ALAA registered caramel and white stud puppy. Size expected: Medium, 17 inches, 30lbs. ACVO Eyes Clear, PRA/prcd, EIC, DM, VWD, and IC are Clear by Parentage. Jammers is super social, loves to be the center of attention and the life of the party! This silly chunky monkey is a non-stop tail wagger, cuddle-bug, and typical noodle-doodle lap dog! He will be small Medium in size and have a gorgeous fleece coat. He has just come home from 3 weeks with a professional trainer for fantastic foundational training and socialization! He has been raised in our home, is crate-trained, house-broken, and fully vaccinated. He will be available as soon as his health testing is completed! Ella will be joining Andy and Bonnie Stanhope in Washington! 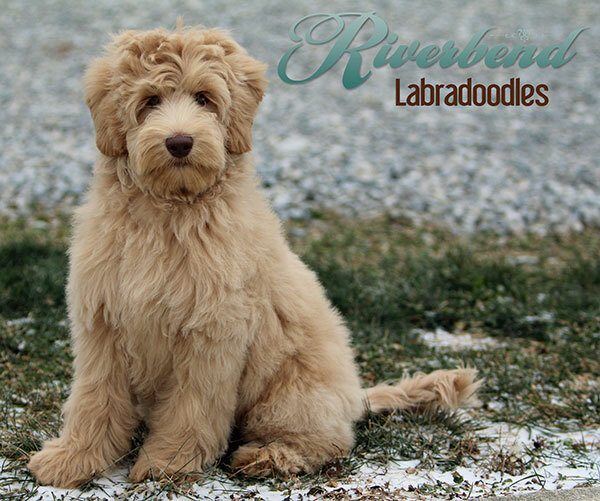 Riverbend’s Ella’s Nursery Rhyme: DOB 2/17/16, Sire: Manor Lake Amadeus Dam: Riverbend’s Pearl, ALAA registered caramel ice female puppy. Size expected: Medium, 17 inches, 30lbs. Hips Wallace Good, OFA Hips Good, OFA Elbows Clear, ACVO Eyes Clear, PRA/prcd, EIC, DM, VWD, and IC are Clear by Parentage. Ella is very smart, athletic, and quite the little comic! She is super social, friendly and outgoing, and loves a good game of fetch! She will be small Medium in size and have a gorgeous fleece coat. Ella has received 3 weeks with a professional trainer for fantastic foundational training and socialization! She has been raised in our home, is crate-trained, house-broken, and fully vaccinated. She is currently available! Cady has joined Labradoodles on Main with Carmela Osborne in Ohio! 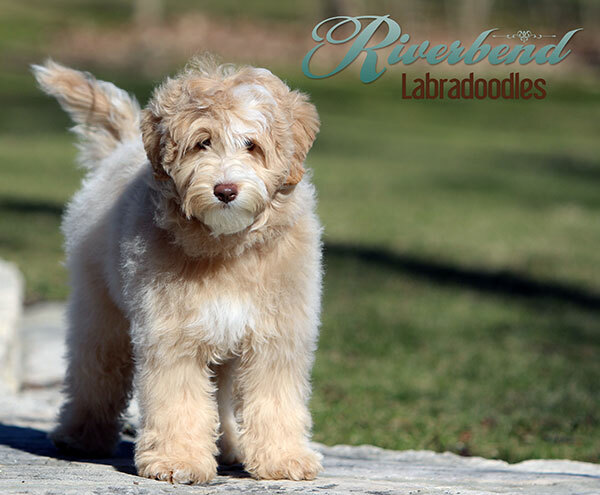 Riverbend’s Caribbean Cadence: DOB 3/12/16, Sire: Manor Lake Amadeus Dam: Riverbend’s Marley, ALAA registered caramel and white female. OFA Hips Excellent, OFA Elbows Clear, Dr. Wallace Hips Excellent, ACVO Eyes Clear, PRA/prcd, EIC, DM, VWD, and IC are Clear by Parentage. Cady has been raised in our home, is crate-trained, house-broken, and fully vaccinated. Cady has beautiful, intuitive, hazel eyes, and a floppy-doodle, gentle, easy-going temperament. She would be an excellent candidate for therapy work, and she loves everyone she meets. Cady spent 3 weeks with a professional trainer building a foundation of great behavior, and expanding her experiences and socialization. She has also spent time with our various Guardian Families and their dogs. Everyone loves her, and raves about what a good girl she is. 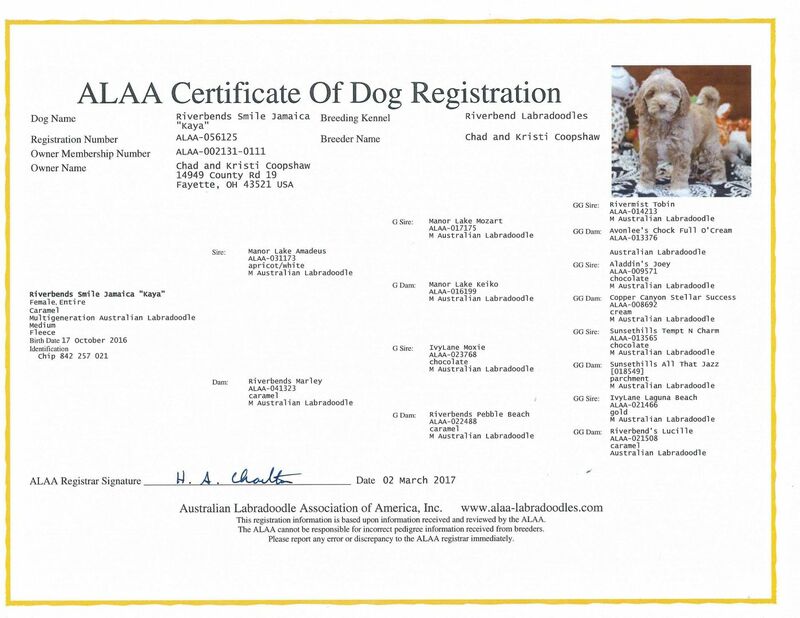 We are excited to see the contributions she will make in the Australian Labradoodle world, whether she joins another breeder’s program, or stays here with us in our program! 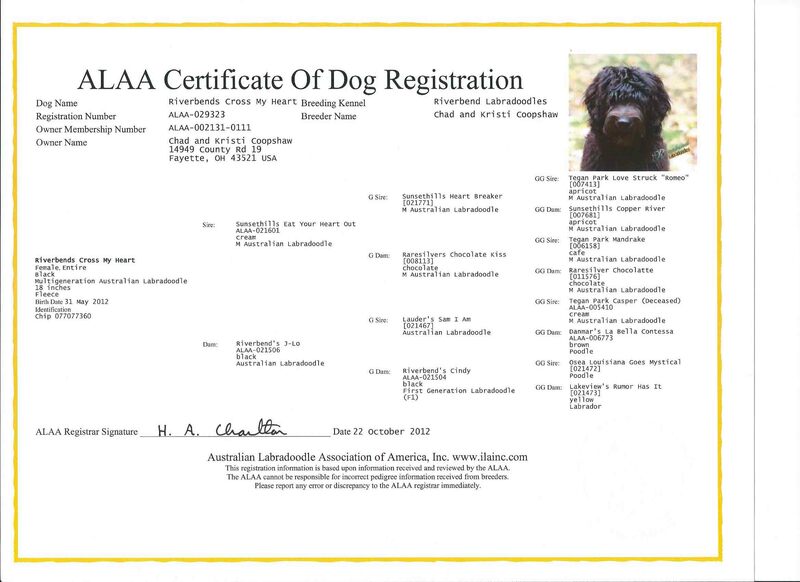 Lyric will be joining Bradley Crate at Forest Hill Labradoodles in Manchester MA! 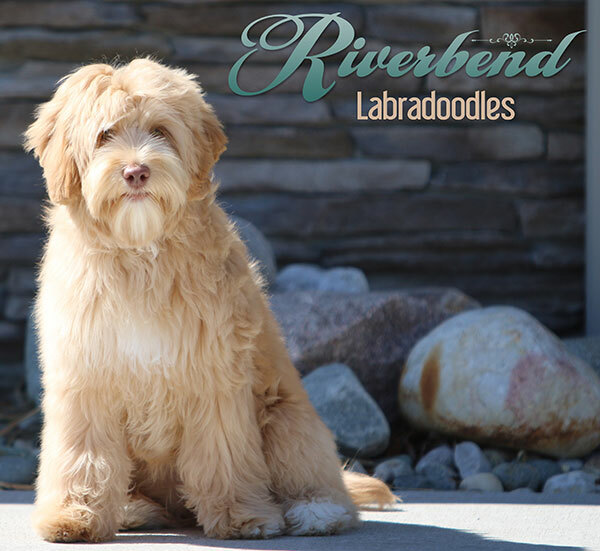 Riverbend’s Lyric: DOB 3/12/16, Sire: Manor Lake Amadeus Dam: Riverbend’s Marley, ALAA registered caramel and white stud puppy. OFA Wallce Hips Good, OFA Hips Good, OFA Elbows Clear, ACVO Eyes Clear, PRA/prcd, EIC, DM, VWD, and IC are Clear by Parentage. Lyric is a stunning boy who turns heads from afar! He is not only drop dead gorgeous, but his temperament is perfection! He is loving, affectionate, social, smart, and always eager to please! He will be Medium in size and have a gorgeous fleece coat. He has spent 3 weeks with a professional trainer, building a foundation of obedience training and expanding his experiences and socialization. Charlotte will be joining Andy and Bonnie Stanhope in Washington! DOB 12/26/15, Sire: IvyLane’s Moxie Dam: Riverbend’s Cameo. ACVO Eyes Clear, Wallace Hips Excellent, OFA Hips Excellent/Elbows Clear, PRA/prcd, EIC, DM, VWD, and IC are Clear. Size expected: Medium, 18 inches, 35lbs. 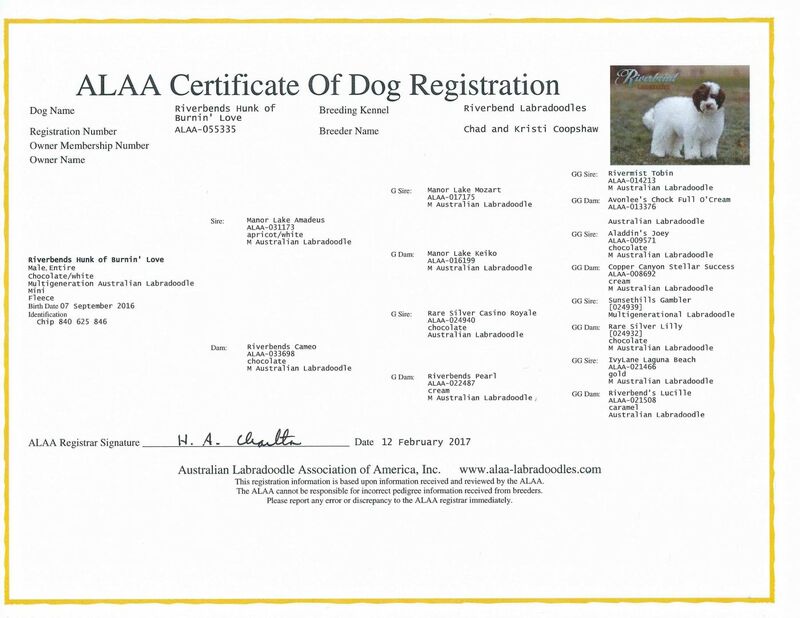 Charlotte has spent four weeks with a professional trainer for additional obedience training and socialization. She has been raised in our home, is crate-trained, house-broken, and fully vaccinated. She has also spent some time with our Guardian Families, and has been exposed to a wide variety of kids, dogs, cats, hamsters, and life experiences. Charlotte has a stunning, magnificent look, with her exceptionally solid boning, and beyond perfect conformation! She has a gorgeous chocolate fleece coat, beautiful hazel-brown eyes, and a face that is irresistible This adorable girl is full of sweetness and kisses and has the most charming personality. Charlotte could do therapy work in the blink of an eye! 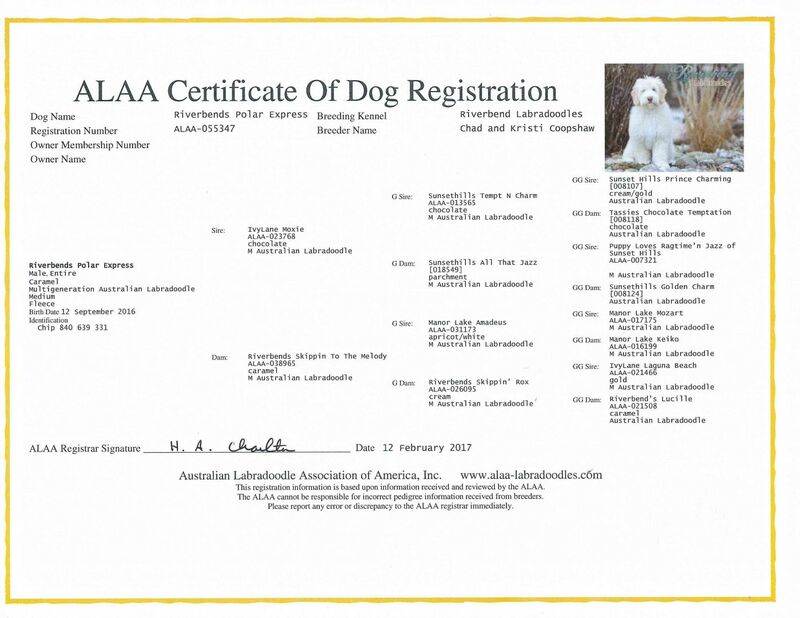 We are excited to see the contributions she will make in the Australian Labradoodle world, whether she joins another breeder’s program, or stays here with us in our program! Daisy will be joining Andy and Bonnie Stanhope in Washington! DOB 12/10/15, Sire: Manor Lake Amadeus Dam: Brasken’s Country River, Wallace Hips Good, OFA Hips Good/Elbows Clear, ACVO Eyes Clear, PRA/prcd, EIC, DM, VWD, and IC are Clear. Daisy is expected to be Medium in size, approximately 17 inches, 30lbs. She is a rich caramel colored girl with a stunning silky fleece coat, exceptional solid boning, and beautiful conformation. Daisy has spent three weeks with a professional trainer for additional obedience training and socialization. She has been raised in our home, is crate-trained, house-broken, and fully vaccinated. Her temperament is absolutely perfect! She is friendly and social, smart and sweet, and gentle and soulful, all wrapped into one. She loves to climb in your lap for noodle-doodle cuddles and belly rubs. 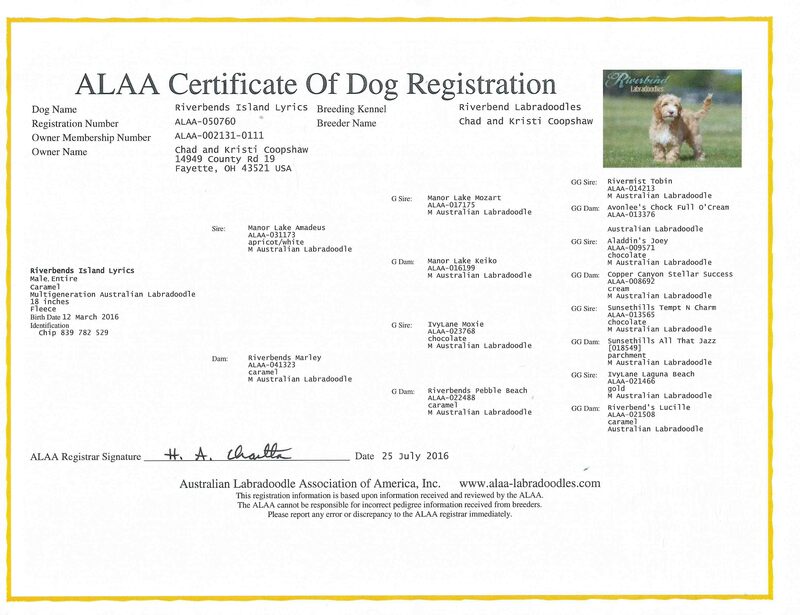 Blue will be joining Carol Stover at Blue Star Labradoodles in Washington! 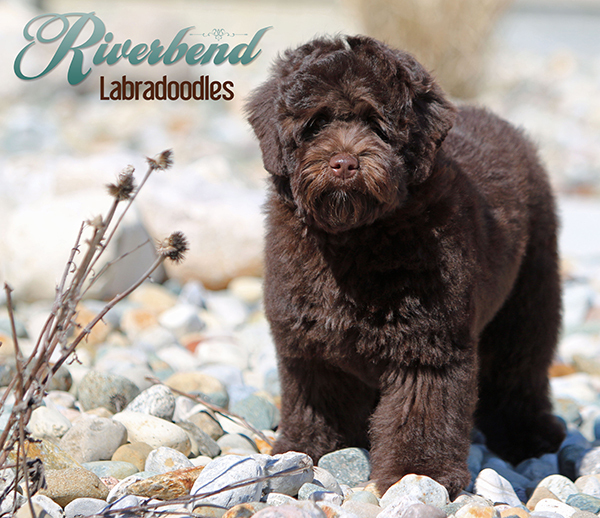 DOB 12/26/15, Sire: IvyLane’s Moxie Dam: Riverbend’s Cameo, ALAA registered chocolate, carries caramel/cream, stud puppy. Dr. Wallace Hips Excellent, OFA Hips Good/Elbows Clear, ACVO Eyes Clear, PRA/prcd, EIC, DM, VWD, and IC are Clear by Parentage. Blue has spent three weeks with a professional trainer for obedience training, and socialization. He has been raised in our home, is crate-trained, house-broken, and fully vaccinated. He loves everyone, is friendly and social, and has a super laid-back, easy-going temperament. We are in love with this chunky boy’s charming personality, and his conformation is flawless. He will be a solid Medium in size and have a gorgeous fleece coat.